Phew! 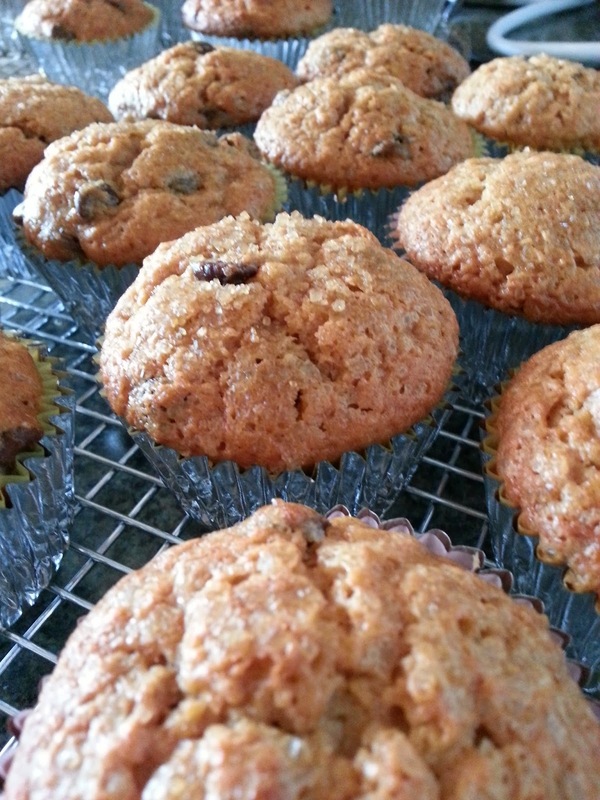 That's a mouthful for a muffin recipe title, but just "banana chocolate chip muffins" doesn't do this recipe justice. In fact, I wouldn't even bother posting a recipe for such a simple thing if it weren't for the extra flavors in these muffins. In any case, I adapted a Bon Appetit recipe to accommodate all the black bananas we had sitting around, begging to be ingested. The base recipe sounded pretty bland, so I thought a little doctoring was in order. Since we had so many bananas, I made a huge batch. If you don't want to make this many, feel free to halve it. And, try to use organic ingredients as much as you can! *I substituted out 1/4 cup butter for 1/4 cup of my Courvoisier Applesauce cause that's a lot of butter. **I put the vanilla and bourbon in the measuring cup and then added the milk to make 1/2 cup. Preheat oven to 350 degrees F. Line 24 1/3 cup muffin cups with liners (or grease the bejeezus out of the muffin tins). Mix flour, sugars, cinnamon, salt and baking powder in a large bowl. Mix mashed bananas, eggs and butter, vanilla, bourbon and milk in a medium bowl. Stir banana mixture into dry ingredients until blended. Stir in chocolate chips. Divide batter among muffin cups, filling each about 3/4 full. Sprinkle turbinado sugar over the top of each muffin. Don't be shy - this gives the finished muffin a nice crunch. Bake muffins until tops are golden and tester comes out clean, about 32 minutes. I generally turn and rotate about the halfway mark. Transfer muffins to rack to cool. And then commence stuffing in face. Wow, those look dangerous. And here I am with some blackening bananas just begging for it! Pinning this recipe to try out when our kitchen reno is done! Yum!